In almost every real life situation it is Natural Persons that manifest themselves in various as well as varying capacities. Therefore it seems wise and natural to introduce systematic information modeling with Natural Persons. The Systematic Information Model (SIM) presented below is not a complete model. The aim here is to start with a small, yet non-trivial, systematic model and to introduce the modeling method. There is, of course, (much) more to say/model about Natural Persons; further models will extend and elaborate on the systematic model presented here. The modeling method used is Metapattern . The modeling notation of Metapattern will be explained while discussing/explaining the model presented. 1. You are a Natural Person. 2. There is exactly one physical/biological you – flesh, blood, bones etc. 3. You can manifest, i.e. identify, yourself in many, many ways: Person Identity. These manifestations vary with the specific situations you find yourself in over time. 4. You can easily find hundreds (literally!) of hyponyms of Natural Person; Mentioning just a few here: civilian, prisoner, criminal, inhabitant, writer, father, child, winner, individual, employer, employee, academic, drunk, diver, manager, doctor, teenager, designer, developer, driver, architect etc. Every Systematic Information Model has a range: a horizon. This horizon is drawn as a bold horizontal line (usually at the top). The model is attached to this horizon. Beyond this horizon lies (still) unarticulated information space. Each lying rectangle is a distinct information node and represents one or more distinct information details. Some information details are strictly limited to the manifestation of Natural Person. Other information details are strictly limited to the manifestation of Person Identity. The line, labeled Natural Person, is the relation that relates its associated information details to the horizon. The line, labeled Person Identity, is a relation as well and relates its associated information details to the horizon. 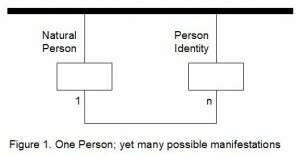 In this small systematic information model the whole of information regarding Natural Persons is differentiated amongst two information nodes: Natural Person and Person Identity. It’s because of the unlabeled line – another relation (1:n) – between these two information nodes that these differentiated information details can be made available in a consistent and coherent fashion. Differentiating information details amongst multiple information nodes enables us to make available various combinations of information details that are situationally relevant. For example: the combination of information details considered relevant in a father-situation differs widely from the combination of information details needed in a situation as an employee. Other, more detailed models will make this powerful mechanism more obvious. Each Person Identity functions (as will be shown in other, more elaborate models as well) as a starting point to relate to unique situational behaviours of Natural Persons – of which we may want to register (and model) relevant information by means of additional information nodes. Whatever Person Identity is situationally used, it’s because of the (n:1) relation with Natural Person that any and all of these manifestations can be unambiguously related to one and the same Natural Person. New behavioural manifestations of Natural Person can be easily added and attached to Person Identity – without changing the model presented above (juxtaposition): a matter of true reuse of information in new and even unforeseen situations! Systematic and Specific modeling . In our real world it is very important to be able to systematically relate the real activities/behaviour – performed using various and varying Person Identities – to one and the same Natural Person. And Natural Persons do use different identities in different situations! A writer can use one or more pseudonyms. A criminal uses several identities to deceive others and to obscure his activities. 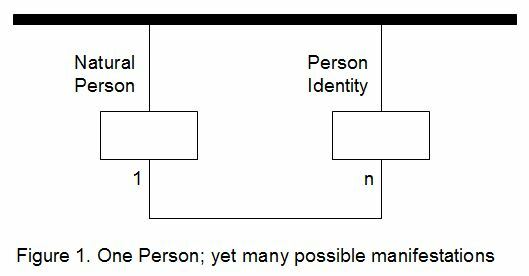 The vast majority of specific information models implicitly presupposes a mono-situational as well as an ideal world in which one Natural Person corresponds with exactly one Person Identity. For a specific model, to be used in one specific situation (mono-situational) and/or rather static environment (idealistic; low variety), this might be good enough. For a systematic model – to be used at an Information Roundabout as an infrastructural facility – this idealistic/mono-situational way of thinking  and modeling falls short, since every and all, current as well as future real world situations must fit in. The systematic model presented above ‘allows’ a criminal to use several identities (e.g. passports and/or driving licenses) without losing track of the one natural Person he/she really is. We’re all living in a real, dynamic, multi-situational and non-idealistic world in need of the support of Information Roundabouts. At an Information Roundabout many participants in information traffic simultaneously need situational information regarding, in this modeling case, Natural Persons. The exact required combination of information details will vary over time and can hardly be foreseen. The Information Roundabout provides you, at your request, with systematically organized pieces of Natural Person information. And you – i.e. the application you’re using combines these pieces meaningful together – serving you with the information you situationally need. Related Systematic Information Models (SIM). 1. Person Numbers: Most Natural Persons are assigned one or more Person Numbers. Learn how to model Person Numbers systematically. 1. For more background information on this modeling method, please study the article Metapattern. 2. The model presented here is taken from a Dutch report, (figure 1 at page 11): Stelselmatige semantiek door Suwinet (2008, Pieter Wisse). In English: “Systematic semantics by Suwinet” (Suwinet being a Dutch governmental organisation). The report aims at systematic information modeling at a (information) societal scale. 3. For additional information on systematic/specific information modeling, please study the article Systematic Organisation of Information. 4. For details about the required way of thinking, please study the article Just Thinking. This entry was posted in Systematic Information Models. Bookmark the permalink.